Dual RF MIMO – Sundance DSP Inc. This is a dual MIMO RF solution with FPGA resource for processing. The radio solution is based on a standalone carrier card with USB interface to a host system for development purposes. It comprises two complete, fully configurable transceiver chains between two dual 12-bit digital I/Q interfaces and two dual-band 50 Ohm antenna ports for each channel. 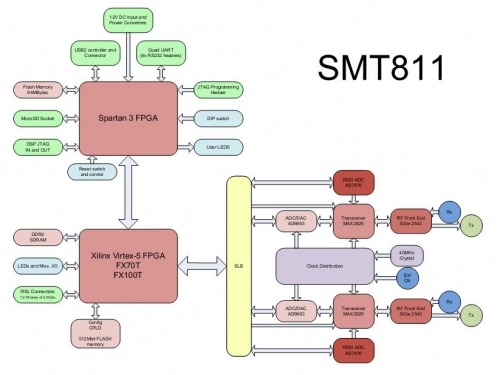 The Virtex-5 FXT FPGA is available in 2 build options (FX70T & FX100T) and two speeds (1 & 3). The FPGA has direct access to 1GBytes of DDR2 SDRAM per bank and is the controller for the ADCs. 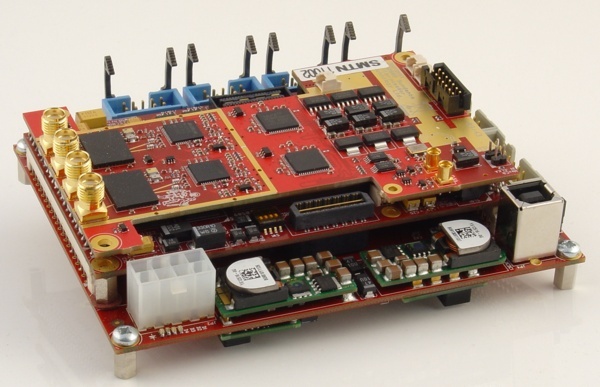 The added Xilinx configuration PROM enables the module to be used in a standalone mode. The FPGA is connected to four RSL connectors for high speed data transfer (up to 3.2GB/s), and the 3x 20-way SLB connector which has 36 pairs of Low Voltage Differential Signals that can be interfaced over a long distance to some external control equipment, or act as an interface to an SLB mezzanine module. This is coupled via comports to small form factor carrier card, complete with a Xilinx Spartan-3 FPGA, USB, RS232, a MicroSD socket and all the power is supplies by the included 12V DC power supply.